The current momentum surprises even Google. A key challenge for corporate communication is the all increasing information overload. This trend has been reinforced in recent years mainly due to the mobile Internet, which we have constantly available via smartphones and tablets. Latest figures show that the trend is even more dynamic than expected. YouTube currently speaks of a massive change in user behaviour. Eric Schmidt, Executive Chairman of Google, said that the growth rate of mobile adoption exceeds everyone’s expectations. And recent studies on email usage reveals surprising results. The future is mobile. YouTube Manager Robert Kyncl said at the conference “Media Summit” in Abu Dhabi, that mobile devices now account for a quarter of all video views offered by the Google subsidiary. “We’re experiencing a massive consumer shift. Mobile has increased from 6% to 25% in last 18 months across the whole of YouTube.” The mobile usage therefore has more than quadrupled. Google’s Executive Chairman, Eric Schmidt, underlines this development in an interview with Walt Mossberg and Kara Swisher from the Wall Street Journal. “Every month, quarter, year, the growth rate of mobile adoption exceeds everyone’s expectations. The phones become so useful that it’s good enough for normal people in lieu of a PC, for day-to-day events.” He also points out that the market for mobile solutions is much larger than the PC market. Being asked about future mega trends, Eric Schmidt called “More Mobility”. Accordingly, the next generation of start-up companies would focus first on the development of mobile applications and offer only in a second step, information services on the Web. The growing importance of mobile information and communication technology is also shown by a study of Litmus, a company in the field of e-mail analysis. Accordingly, mobile devices have taken over webmail and desktop email opens. 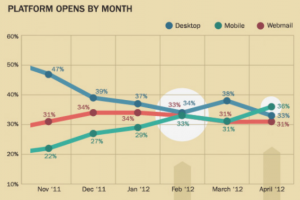 With 36%, they have the highest share of email openings, followed by desktop solutions with 33% and webmail with 31%. The usage of mobile devices has increased by 80% in the last six months. 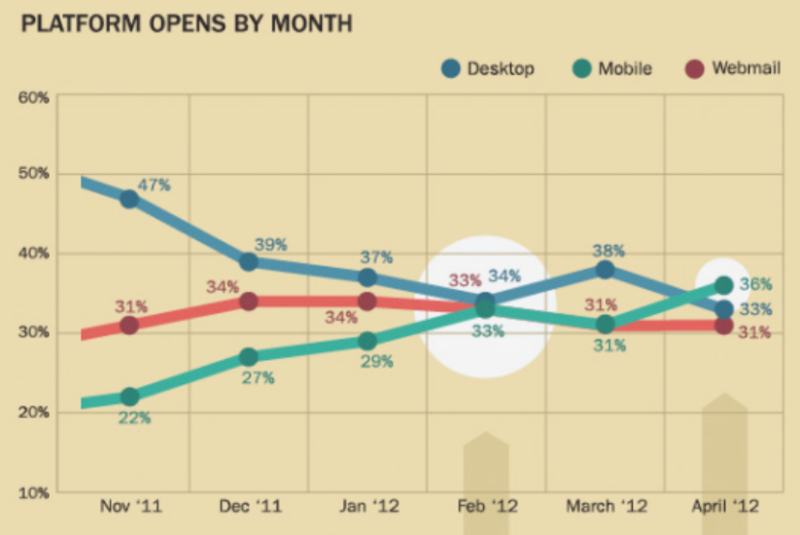 This trend is also demonstrated by the market share of email clients. Outlook by Microsoft has been overtaken the iPhone, which now ranks at 20% of all opened emails on the first place. The trend towards greater mobility is evident. It provides companies new opportunities to communicate both with their existing and potential customers. At the same time it reinforces the phenomenon of information overload. The question is how to reach a targeted audience in this flood of information.